Delhi witnessed a very special theatre and dance show, in which children with hearing impairment took part. The show was part of the annual day celebration of Lepra India Trust, which works for the cause of leprosy affected in India. Around 120 children and youth having varying degrees of hearing impairment participated in the function. All the participants belong to below poverty line families. 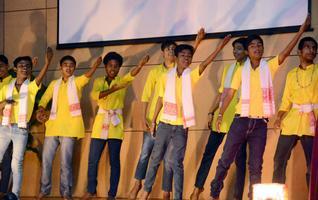 As part of the event, there were songs, skits and dances involving social themes including cleanliness. “They have worked very hard to reach this level. It has been a unifying and integrating effort, and the common theme is hunger to learn English and the world of computers as well. In the case of the young women, the beauty course is an attraction,” a spokesperson of the trust said. “It is not just a show. It is cooperation, cohesion and learning through theatre and dance,” the spokesperson added.